Enzo Bianchi: In any case, if the other does not accept or receive forgiveness, the one who forgives, in forgiving, affirms gratuitousness. He affirms that he wants to re-initiate the relationship with the other—the one who wronged him—from the beginning. He wants in some way to say that he does not want reciprocity. This to me is what is truly and profoundly human in forgiving. Gratuitousness is basic to the life of a person, because this is how we know ourselves to be human. Gratuitousness is an escape from alienation and commoditization. Altruistic Products: a contradiction? Muhammed Yunus doesn’t think so. Muhammed Yunus, the Bangladeshi economist who started the now global micro-lending movement, has a new business idea he is pitching to a few global companies: altruistic products. As a consequence of fundamental alterations in the nature of capitalism the entire global economy has become extremely unstable. As a protagonist in the Economy of Communion movement, Bruni sees this as one important means to bring solidarity into the market. “The church is bombarded with two competing messages about money and capitalism. 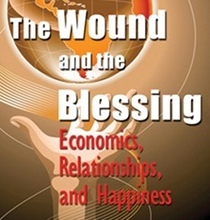 The first message is that wealth is bad and causes much of the world’s suffering; the second is that wealth is good and God wants you to prosper and be rich.” There are two foci in the quoted text: wealth and self. This seems a misfocus; the 2nd greatest command is about the self to other relation, not self to wealth. I’ve recently run across the Austrians a bit while listening to some podcasts on RAI3 from an economic conference held by Italian economists a couple of weeks ago in Italy. Most of these guys are not of the Austrian school, but in a little research on the ideas I’ve run across the Austrians a bit. It looks like interesting stuff, but questions remain. This is a brief introduction to my translation into English of the Italian economist Luigino Bruni’s essay “Bene Comune ed Economia: per una economia agapica”, or “Common Good and Economics: toward an agapic economy”, in which he proposes four possible ways to introduce agapic love into the marketplace.